Intelect provides a wide range of services and solutions for your electrical systems. When you need help consulting for your commercial or industrial electrical projects, or assistance with electrical work related to telecommunications, security, IT, or ITS, we can be there for you. While many of Intelect’s electrical services are similar for all our customers, we also have proven experience in handling the unique needs of different markets. In addition to our extensive custom work in transportation systems for Government and commercial organizations, we also understand the specific requirements for electric systems operated by utilities, engineering and construction firms, OEMs, and telecom service providers. Browse our complete set of products, services and solutions for all our markets. 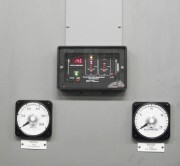 The Integrated Compact Power System (ICPS) is a unique electrical utility disconnect panel that combines multiple AC branch circuits and DC circuit disconnects into one single space-saving, lightweight panel. This greatly reduces costs, installation time, and space requirements so you can take advantage of unique power, test, and disconnect features. The ICPS is designed and manufactured exclusively by Intelect. Learn more about this all-in-one power solution. 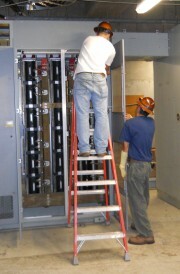 Is your substation due for a renovation? If so, contact Intelect by email or call 410-327-0020 now! We know the critical importance the substation plays in your train operation, and we have the knowledge and equipment to raise the unit, handle rewiring and other facets of this complex job. We’ve done this for many energy and transportation organizations, and would welcome the chance to assist in your next project. The Intelect team is certified in the application of Cembre ™ bonding systems, so we can offer you testing, repair and refitting of high-voltage rail bonding systems. The Cembre system is the product of choice for European and international railroad mass transit, where aging traction power infrastructure (with outmoded G-clamp and welded bonding systems) needs to be upgraded. Once installed, Cembre bonding products provide a low-resistive, high-strength connection to the rail, virtually eliminating cracked rails at the site of the bond and allowing them to be easily removed for rail maintenance and testing. We can also perform high- potential testing on rail jumpers, main power feeder and grounds. Contact us at 410-327-0020 or by email today to see discuss your electrical needs!